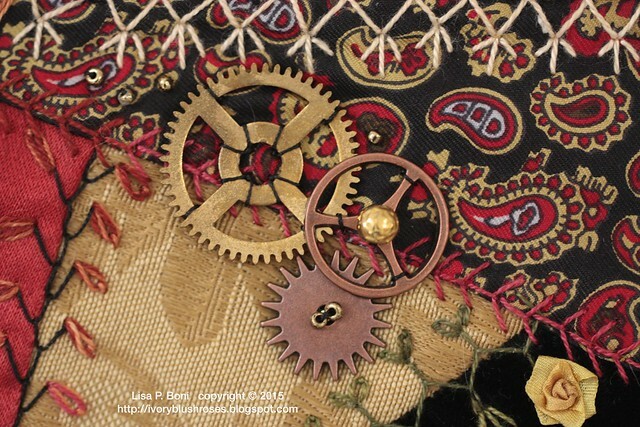 At the CQI retreat in September, we started a Steampunk Round Robin with a few of the participants. 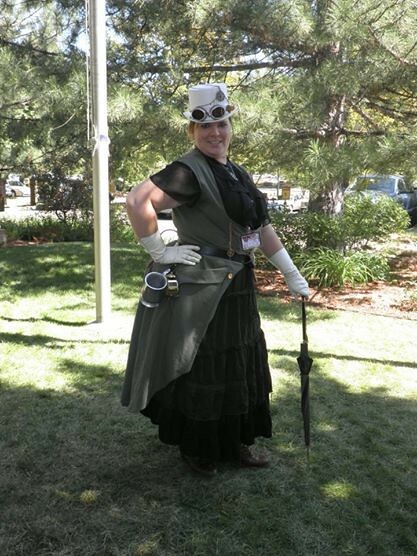 My daughter is crazy into Steampunk and is very involved with a Colorado Steampunk group that visits fun destinations like the Railroad Museum in costume, puts on a weekly cable radio drama, and puts on a growing annual convention known as Anomaly Con. I knew I wanted to do a wall hanging for her, and this was a perfect opportunity! 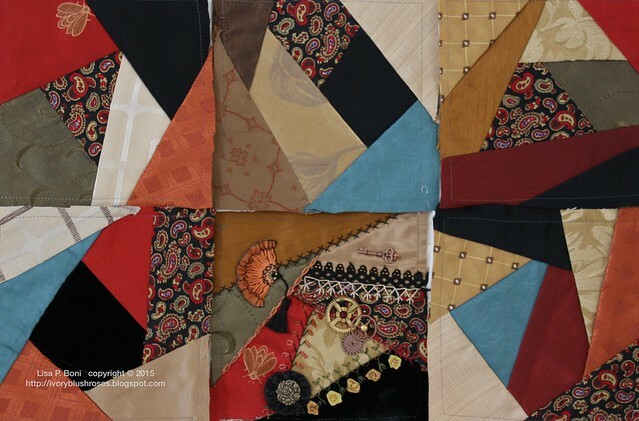 Lonna chose some lovely warm Victorian colors for her blocks and it wasn't hard to choose one! Jessie generously made available to me, her extensive collection of Steampunk paraphernalia that she uses to create jewelry and costumes from. 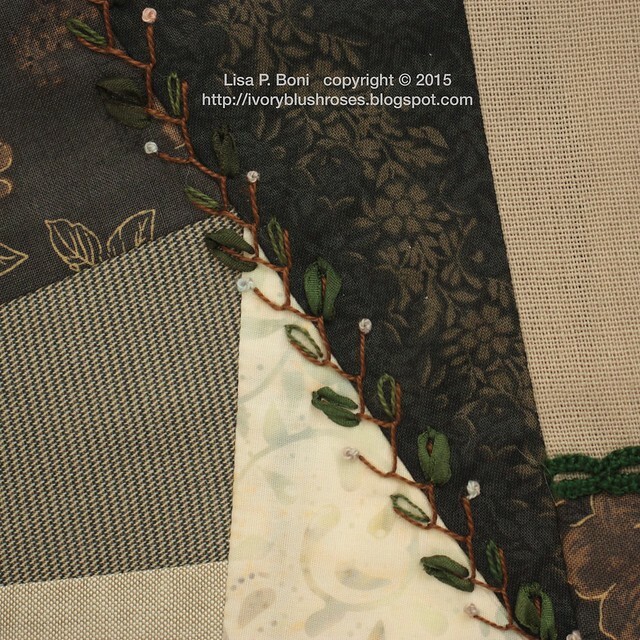 What fun to include some of them on Lonna's block! 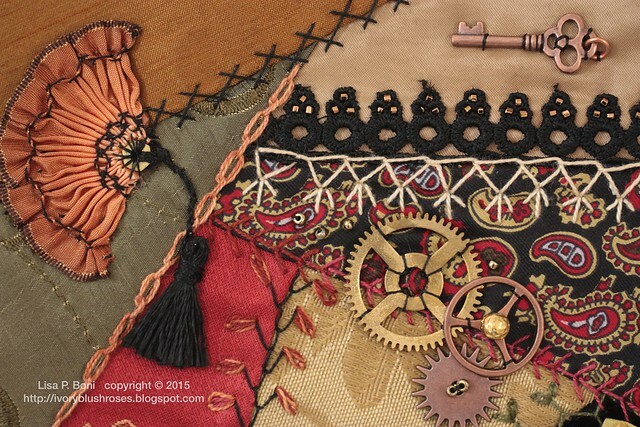 I kept most of the seam treatments fairly simple as both the theme and the block seemed to want more traditional Victorian style seams. I've had a photo of a smocked silk fan in my idea folder for a very long time and as I was thinking about what to add to this block, it came to mind and so I searched out the creator. 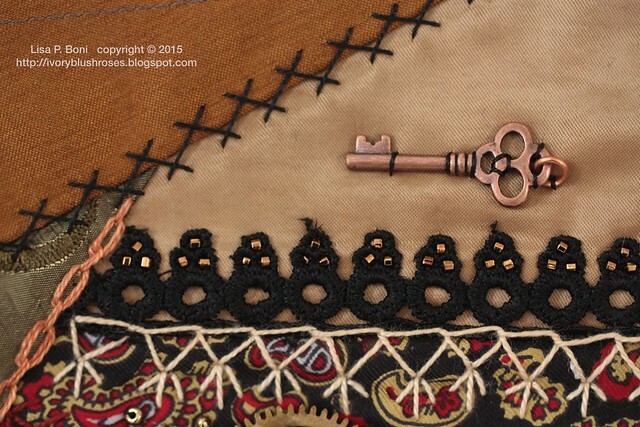 Her blog Tinctory is no longer active and sadly, she is not currently doing any stitching/smocking, but her blog is well worth perusing for inspiration! I created my own version of one of her fans using some ombre ribbon from my stash and using a brass nut for the handle. The tassel was made with rayon floss. Some black lace accented with brassy toned beads worked very well on this block, as well as the copper toned key charm. Lonna asked for flowers to be included on her blocks, even though they aren't typical in a Steampunk theme. 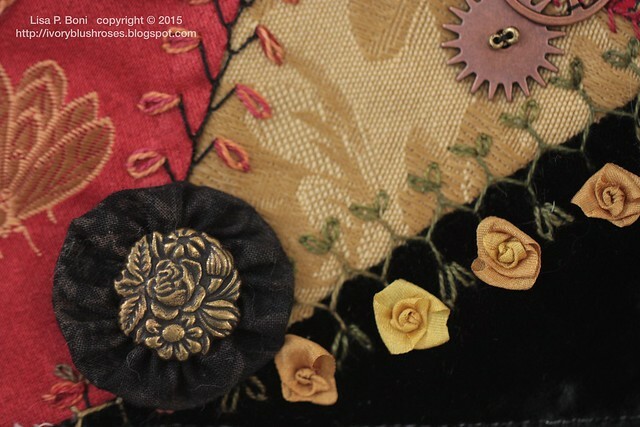 I had a lovely brass button that I backed with a yo-yo in a black/brown fabric and added a row of golden toned Fargo roses. The gears came from my daughter's stash. Some are new, but the large brass gear is out of some old clock. I am the first to work on Lonna's blocks, so I hope that I've gotten them off to a good start for everyone else to come. The blue fabrics are not nearly as bright as the camera makes them appear! 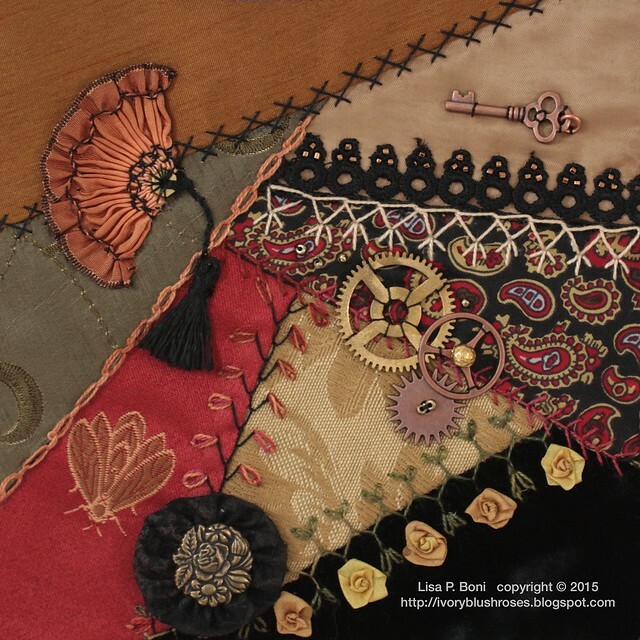 I joined Valerie Bothell's Joyful Embellishments group on Facebook. She is posting 5 seam treatments a week for us to re-create. 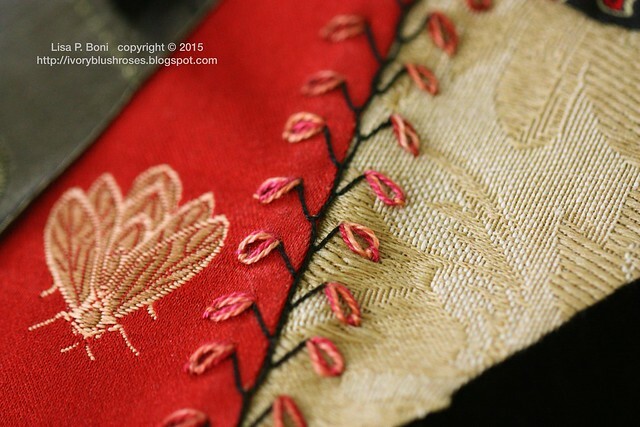 This month, the focus is on variations of the feather stitch. I did the first one on Lonna's block. To make the lazy daisies stand out on both fabrics, I used a double strands of thread to make them pop. I also turned the daisies facing down instead of facing up as was shown. It worked perfectly on this block! 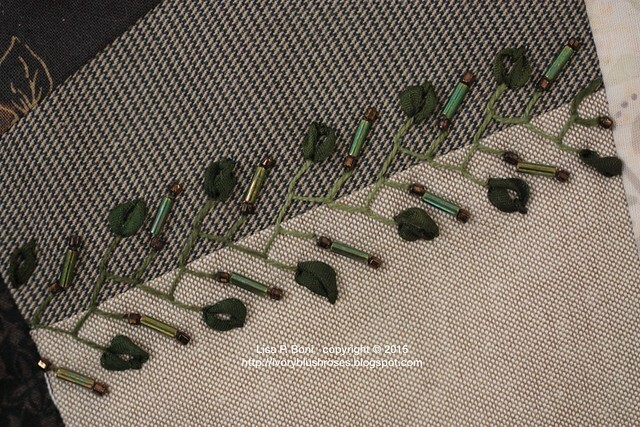 Most of my "Joyful Embellishments" stitches will be done on the taupe runner/bell-pull. It will be a great way to get this large piece stitched up by the end of the year! Seam #2 was a curved feather stitch with lazy daisies. I used a variegated Valdani perle cotton for the feather stitch and DMC pearl cotton for the lazy daisies. I must say that I really love the subtle variation in the Valdani threads. Their mostly muted colors work really well in my serene world! 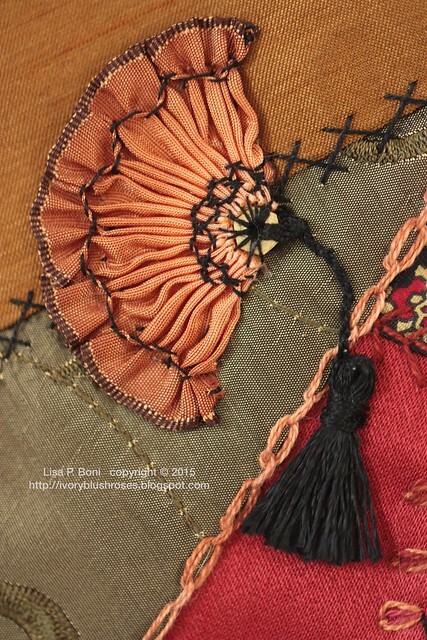 Seam #3 is a feather stitch with lazy daisies in both thread and silk ribbon embroider and some french knots. 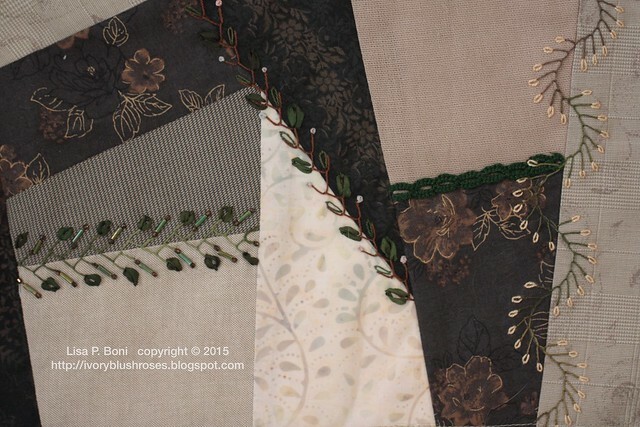 Seam #4 is Triple (aka double in some books) feather stitch with silk ribbon lazy daisies and beading. I have these great vintage green bugle beads that I used here and the little bronze seed beads are from a disintegrated Victorian era beaded purse. 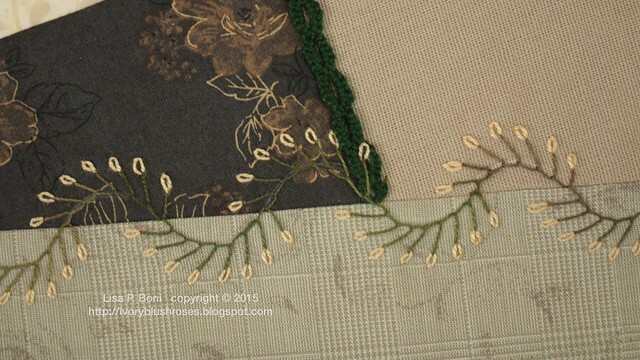 I am loving stitching in these soothing colors after working on my CQJP block! Though I'll be back to that block very soon! I'm glad that I lined up a mix of projects to work on so that the bright blocks don't get too overwhelming and keep me from stitching! Wow! Your stitching shows me I have much to learn. Your blocks are great as always. Очень красиво! Люблю то, что Вы делаете!